Baton Rouge, LA – September 5, 2014 – Lamar Advertising Company (Nasdaq: LAMR) is bringing the essence of the U.S. Open to life on a New York City billboard in a unique way. Whereas one may assume that Lamar would be broadcasting live streaming content from the event in real time on its network of digital billboards, this presentation is of a more artistic nature. Beginning at 6:30 each morning of the U.S. Open, artist Josh Cochran is hoisted up on Lamar Advertising’s billboard standing above the Midtown Tunnel. 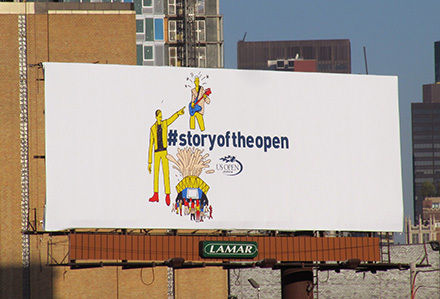 As part of The “Story of the Open” campaign, created by DDB New York, Cochran hand paints a new addition to the mural based on interpretations of moments from the event and online commentary, such as Roger Federer's selfie with Michael Jordan. Having begun on August 25th with what was essentially a blank canvas, Cochran has been chronicling the Open ever since, bringing rich depictions of the open for New Yorkers to enjoy during their morning and evening commutes. 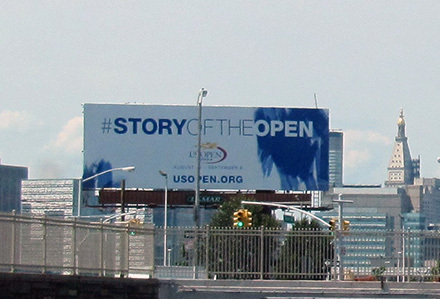 The initial design for the U.S. Open campaign featured a simple design with the U.S. Open logo, hashtag #storyoftheopen and website (shown above). Two weeks later, the design was replaced by a mostly blank canvas, and new installments were hand painted each day. Above is the hand painted billboard on Day 2 (shown above). Each new illustration is filmed, streamed live on Facebook and posted on YouTube with the hashtag #storyoftheopen. There will be a total of 15 hand painted installments once the event comes to an end on September 8, 2014. Lamar Advertising Company (Nasdaq: LAMR) today announced that Sean Reilly, CEO of Lamar Advertising Company, is scheduled to participate in a question-and-answer session at the Goldman Sachs 23rd Annual Communacopia Conference in New York City on Thursday, September 11, 2014 at approximately 8:00 a.m. ET.